Sunday, August 6, 1911: Went to Sunday school this morning. Carrie and I took a short stroll this afternoon. We had intended to take a longer one, but we decided that it would be too hot. We talked about getting up a picnic, and the thought may be carried into execution. Who knows. Grandma mentioned the hot weather several times during Summer 1911. The other times I could find articles in old newspapers which confirmed that the weather had been very hot on that date. But I can’t find anything in 1911 newspapers about unusually hot weather on August 6. Maybe the sun just felt really hot to Grandma and her friend Carrie Stout even though the temperature wasn’t particularly high. Rumor is rife these days. It is said that skirts are to be narrower than ever in the Autumn; that all waists are to be excessively short; that divided skirts will be the rule . . . .
Hmm—I’ve heard a rumor that the arbitrators of fashion are saying that narrower skirts are in for this upcoming autumn. 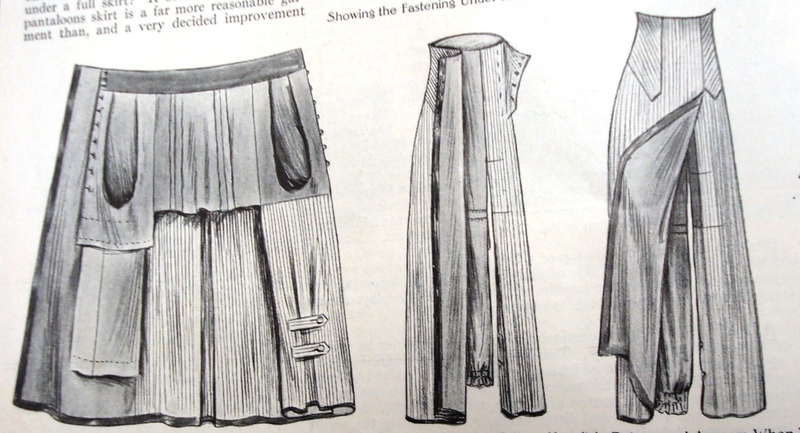 When I read the New York Times article, I remembered that I’d seen these drawings of a type of narrow skirt–the trouser skirt–in the June, 1911 issue of Ladies Home Journal.